History: The freshwater cyanobacteria genus Microcystis includes some of the dominating cyanobacteria species in algae blooms and is distributed worldwide. 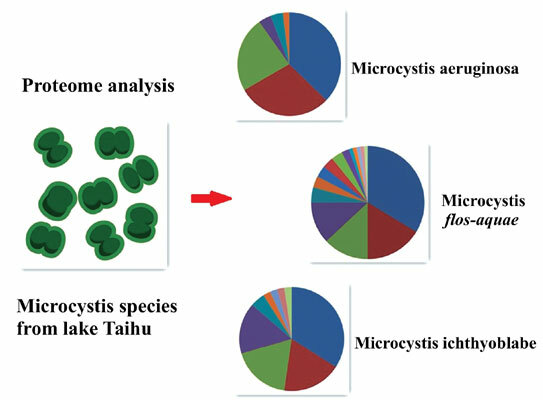 Method: We collected three types of Microcystis, M. aeruginosa (FACHB 912), M. flos-aquae (FACHB 1028), and M. ichthyoblabe (FACHB 1294), from Lake Taihu in China to analyze their secretome in culture medium using shotgun proteomics. Observations: We identified 51, 92, and 44 unique proteins in M. aeruginosa, M. flos-aquae, and M. ichthyoblabe, respectively. The largest fraction of proteins had an unknown and hypothetical function. Results: Only five (MAE27990, MAE06090, MAE59990, MAE47530, MAE36530) of these proteins were expressed in all three Microcystis species. Gas vesicle structural proteins were present in the secretome of both M. aeruginosa and M. flos-aquae, but not in that of M. ichthyoblabe. Conclusion: This comprehensive dataset provides a novel insight into the composition and function of cyanobacterium secretome. We also analyzed proteins found in our proteomic experiment that were related to Microcystis buoyancy motility. Keywords: M. aeruginosa, M. flos-aquae, M. ichthyoblabe, shotgun proteomics, culture medium, harmful algae blooming. Keywords:M. aeruginosa, M. flos-aquae, M. ichthyoblabe, shotgun proteomics, culture medium, harmful algae blooming. Abstract:History: The freshwater cyanobacteria genus Microcystis includes some of the dominating cyanobacteria species in algae blooms and is distributed worldwide.